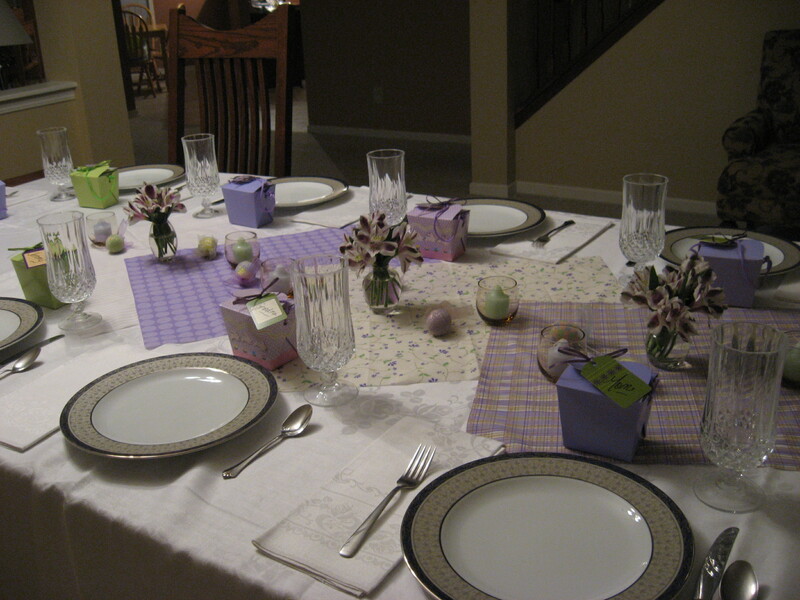 I love holidays and Easter is the one I most often host for my great big family! Planning the menu, setting the table, designing the favors/placecards, and then actually cooking are all so fun for me. For the past couple of years, I have done an Easter brunch with ham as the centerpiece. I'm always looking for an excuse to serve brunch. Unfortunately, I'm not hosting this year since we are still living in a hotel from the smoke damage a couple of weeks ago. We are making the best of it and I will still be helping with some of the cooking at my parent's house and I'm planning to do the favors. Anyway, here are a few recipes that we enjoy for a special brunch. I often use asparagus and tomatoes with a balsamic vinaigrette so I'm posting two version of this recipe but only have one photo. These are both beautiful with lots of color! Combine all vegetables in a pretty serving dish. Season with salt & pepper. Dress with Italian dressing and toss. 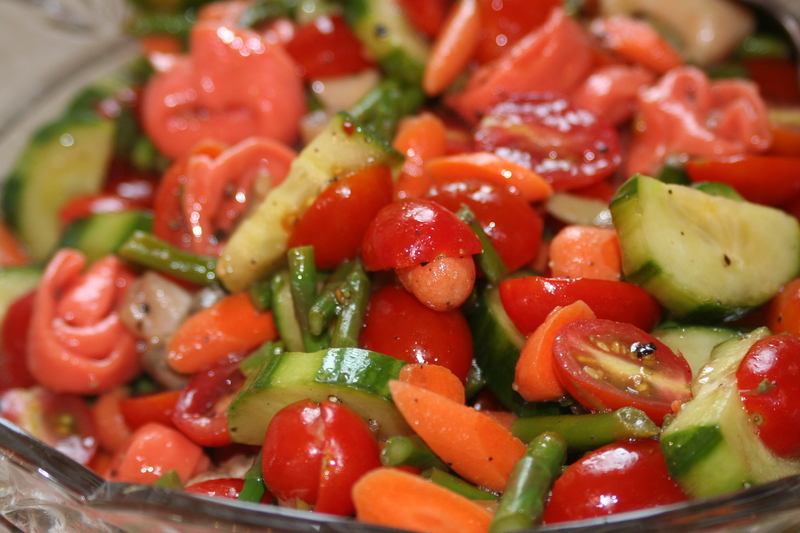 Allow salad to marinate for at least 30 minutes before serving. Serves 8 or so. Combine tomato and aspargus. Season with salt & pepper. Dress with twice as much olive oil as balsamic vinegar (or you can purchase a Balsamic Vinaigrette (Newman's Own is excellent). Toss to coat. Makes 8 servings or so. 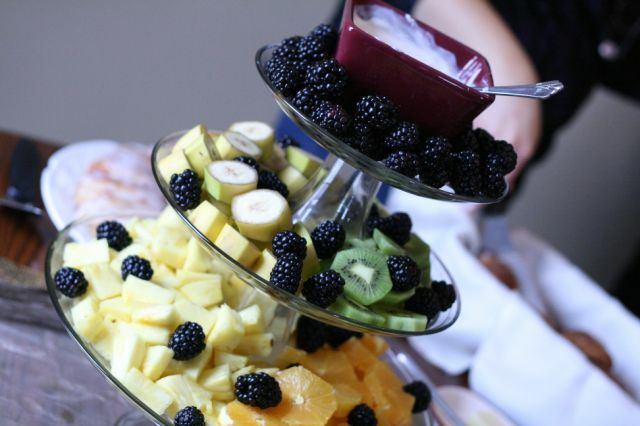 These tiered platters make fruit presentation gorgeous! For Easter, I would add strawberries even though it's a little early for them, I love that they remind me of spring! You can use whatever seasonal fruits you want. Arrange them on a platter and serve with this simple dip. Combine all ingredients. You can add more honey if you prefer it sweeter. Serve with fresh fruit. 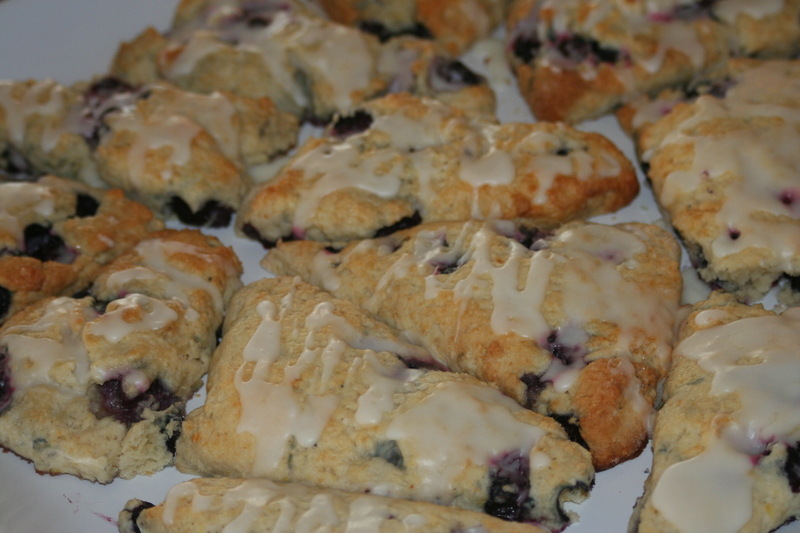 I made these blueberry lemon scones and they were delicious! They are also beautiful! Lemon is another spring-y flavor to me. So these would be an excellent brunch addition. Sift together the dry ingredients. Using 2 knives or a pastry blender, cut in the butter to coat the pieces with the flour. The mixture should look like coarse crumbs. Stir in the lemon zest. Make a well in the center and pour in the heavy cream. Fold everything together just to incorporate; do not overwork the dough. Fold the blueberries into the batter. Take care not to mash or bruise the blueberries because their strong color will bleed into the dough. For the glaze, combine the lemon juice, sugar, zest, and melted butter. Whisk to incorporate and remove any lumps. Drizzle on warm scones. This all looks scrumptious! Have a Happy Easter despite the unfortunate circumstances!